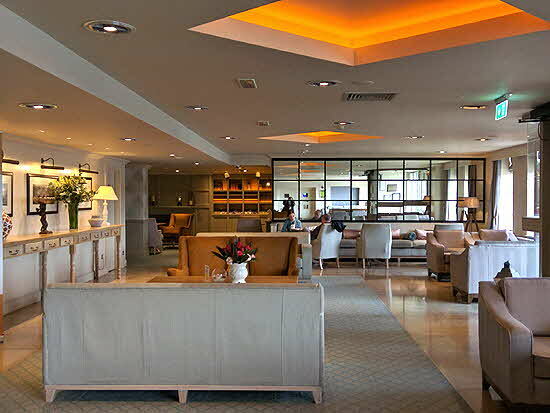 While a primary motivation sending travelers to the coast of County Mayo is to climb Croagh Patrick, a stay at the Westport Coast Hotel and Spa Veda is reason in itself to make a pilgrimage to northwest Ireland. Croagh Patrick is the mountain -- well glorified hill -- revered as the place where St. Patrick fasted for forty days and forty nights--interrupting his vigil to drive all the snakes into the sea. Devout Catholics ascend the rocky path, some barefoot or on their knees; hikers tackle it just “because it’s there”. Whether or not you chose to make the trek, or as a “reward” for completing the climb, the nearby Westport Coast is a desirable place for R&R. Situated overlooking Clew Bay and green hills, the hotel anchors a popular strip of Quay village boutiques, accommodations and restaurants. Automatic doors welcome visitors to a contemporary lobby fitted out with comfortable sofas and chairs. The efficient check-in desk is opposite the doors and guests are ushered straight up to stylish rooms, many of them overlooking boats bobbing in the harbor below. Along with the king size beds, rooms are furnished with a table and chairs, desk, and open closet. A hot water machine brews instant coffee and tea, amenities in the spacious bathroom include shampoo, shower gel, and body lotion. Suites include separate seating areas, use of bathrobes and slippers, complimentary homemade chocolates and cookies, 10% spa discounts. 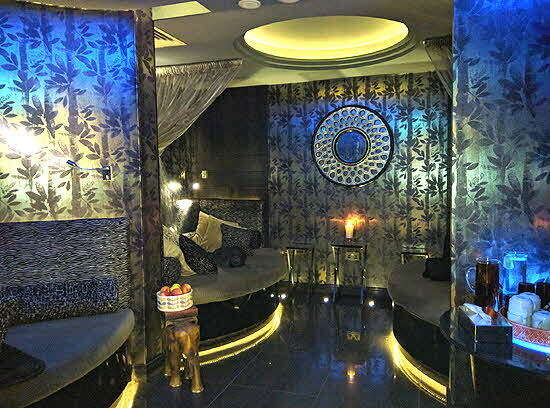 Conveniently located between the first and second floors, the Spa Veda offers a full range of services based on the ancient Ayurveda system and carried out by practitioners from Kerala in India where the theory originated. A menu of massages includes Swedish, Firm, Sports Recovery. Heat rituals include treatments with heated oil, hot stones, herbal poultices. All guests are welcome to use the Thermal Suite facilities at the indoor pool and Jacuzzis... rock and salt saunas, a steam room, an ice fountain, and tropical rain shower. Besides Afternoon Tea featuring sandwiches, scones, and optional champagne, generous meals are served in the bustling first floor Coast Bar. 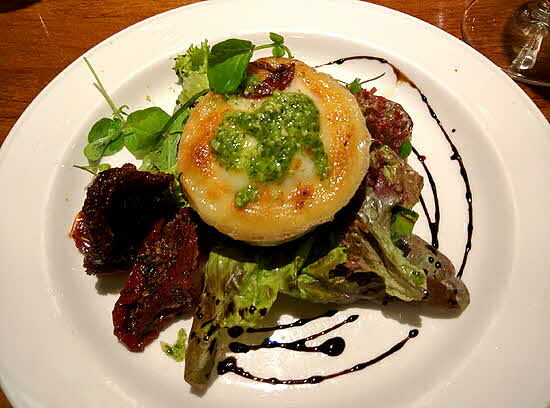 After sipping a light Mescan local craft beer, I started with a delicious mushroom cap stuffed with local goat cheese and garnished with onion marmalade pesto. A glass of Italian Azienda Fattori Pinot Grigio cost seven euros to accompany the grilled hake main course which was served up with spicy shrimp, ubiquitous chips -- French fries -- and tossed salad with a light tasty dressing. A puff of sticky toffee dessert was served with butterscotch sauce garnished with both whipped and ice cream. More formal meals are served in the Waterfront restaurant on the top, fourth floor, with slanted windows looking out to the view. 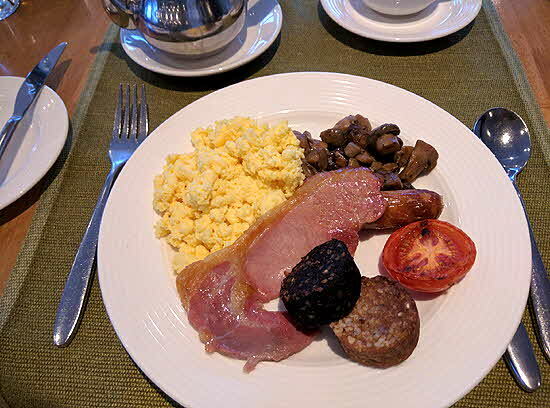 The bountiful breakfast is also served in the Waterfront -- a complete fruit, cereal, bread buffet which augments a choice of hot dishes -- Irish breakfasts “full” or the more than adequate “mini”� which includes eggs, ham, three types of sausage and a choice of mushrooms or beans. Besides the option of trudging up Croagh Patrick, activities include fishing, cycling, kayaking, sailing, horseback riding, 10-pin bowling. Just down the road from the hotel, a walking tour circles the hills.� Other tours and visits can be arranged to nearby Achill Island with Europe’s highest sea cliffs and Clere Island with the castle of 16th-century pirate queen Grace O’Malley. 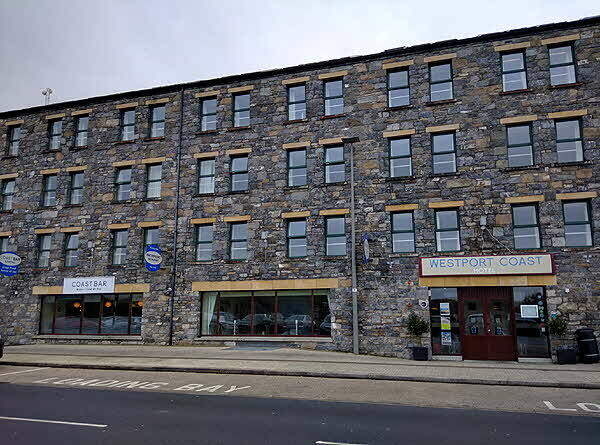 dozens of gift and souvenir shops which retain their vintage facades are well stocked for shopping in charming Westport, and visitors can tour heritage Westport House called “the most beautiful house in Ireland”. Whatever activity you chose, never fear, St. Patrick preceded you... you won’t encounter any snakes. © January 2018 LuxuryWeb Magazine. All rights reserved.